The Fossil Q Founder achieves its aim of having a smartwatch that looks like a proper watch, but these days that's not a unique selling point. Even traditional gadget makers are achieving similar results. Once gadget manufacturers started producing smart, connected watches, it was never going to be long before traditional watch brands got on board. Companies like Tag Heuer, Casio, Nixon and Michael Kors have all launched Android-powered smartwatches, as has one of the most popular fashion watch brands around: Fossil. The Fossil Q Founder is the company's first foray into the full-in Android Wear smartwatch market, a device which has since been joined by the unveiling of Marshal and Wander devices. Elsewhere in the Q-range are some basic connected gadgets with fitness and health tracking benefits. But we're here to talk about the Q Founder, the foundation of the company's smartwatch offering. A watch that, just like the Motorola 360, has a black-out "flat tyre" bar in its design. Does that singular design feature cost this fashion brand dear, or is this the Android Wear watch to go for? Fashion brands and watchmakersare benefitting the smartwatch hype-train by producing products that look a lot more like a "proper" watch. So much that it's started to influence the electronics manufacturers - you just take a look at the Samsung Gear 3 to see that. That's not to say companies like Motorola, LG and Huawei haven't given it a good go. But the fixtures, clasps and overall look of the Fossil Q Founder seems a little more watch-like. It feels more like the real deal. The large 47mm circular casing has a polished, bevelled edge, while the metal link strap has a reassuring heftiness and opens and closes using a familiar-styled one-button clasp. If a chunky metal link bracelet isn't to your taste, you can buy the Q Founder with a leather strap. What's more, you can easily swap out the strap for another that you like thanks to the addition of the quick release pins on the strap lugs. The watch will accept any 22mm watch strap, so whether you prefer leather, canvas or a milanese-style bracelet, you'll be able to fit your own. Fossil opted to decorate the single button on the side of the casing in a housing that looks and feels like traditional crown. The textured finish tempts you to try turning it, but sadly it's just a push-button. And just like virtually every other Android Wear smart watch available, it's the only button. Underneath the watch's main bod is a matte black disk which sits very comfortably on the arm. There's no heart-rate monitor here, so it's completely smooth and comfortable to wear. On the whole, the quality of the round 360 x 326 resolution screen is great. Details are sharp at this size, meaning there's no obvious fuzziness or distortion at arm's length. What's more, gradients and colours show up really nicely on the display, meaning it's great for colourful watch face choices. There is one big drawback, though, which can't be ignored: the "flat tyre" black-out bar to the bottom, which we've already mentioned, stops the watches round face from being truly "round", as nothing displays in this bottom section. The second minor complaint is to do with screen tech choice: the Q Founder uses an LCD panel, not AMOLED, so the always-on ambient screen isn't very high contrast, making it hard to see the time when the watch is inactive, especially in bright daylight. At the moment, the Q Founder runs Android Wear v1.5. With Google having a fairly tight grip on the Android Wear ecosystem, it's no surprise that the software experience is pretty much identical to every other watch loaded with the wearable operating system. Like other watch makers, Fossil has added its own unique flavour by pre-loading it with its own bespoke watch faces. These can be customised using either the on-watch setting options, or you can download and install the Fossil Q app from the Google Play Store on your Android phone. Android Wear does also support iOS for Apple users, but it's rather limited. READ: What's Android Wear really like on iOS? The Fossil Q app for Android allows you to adjust colours and styles of the watch faces, plus choose what information should show up in the onscreen widgets. The only problem with the smartphone app - and it's a major one - is that more often than not it either forgets your watch exists or pretends it's not connected. Whoops. Often when launching the Q app, we were met with a screen asking us to setup a watch as if it never had been, or leading us to the watch overview screen with a notice saying it wasn't connected. When it works, however, it offers a great number of customisation choices. That's without mentioning our general frustration with parts of Android Wear that still seem unintuitive. Sure, that's Google's fault, but it's an ongoing issue we feel with all such devices. For example: the cards that come up to show part of a notification aren't well designed, often showing the same Google Now cards over and over again, even after being dismissed. Rather than go with Qualcomm's Snapdragon chips, Fossil partnered with Intel, with the result generally decent. Cards swipe away easily, while scrolling through the list of apps and the settings is speedy and mostly stutter-free. The one area of performance we found weak was the automatic raise-to-wake feature. If it worked, there was a noticeable delay between lifting an arm and the screen activating. Sometimes it didn't wake up the screen at all. We also experienced a delay when using the "Ok Google" voice search feature. But we've found that to be the case with many other Android Wear watches out there - again, Google's fault. The 4GB of onboard storage ensures that if you do want to save a few albums onto your Fossil watch for offline listening via Bluetooth earphones, you can do - and not worry about having to take your phone with you. Other hardware features include the usual collection of fitness-tracking sensors for counting your steps. But as there's no heart-rate monitor, as previously mentioned, and no GPS built-in, this watch isn't really designed with fitness fanatics in mind. Not that you'd take a watch like this on a run anyway. With an Android Wear watch it's generally considered good if the wrist-worn device can make it through a full day without dying. With the Q Founder, that's certainly the case. Even with a long, busy day beginning at 7am and ending after 10pm, we still found the 400mAh battery made it to bedtime with around 30 per cent charge remaining. Sadly, it never made it to the end of a second day in testing, even with minimal use. Once depleted, the watch battery can be recharged using the charging stand which - although seeming cheaply made - is far more attractive than most of the docks or cradles that usually come in smartwatch retail boxes. The main middle section of the cradle is cushioned and coated in a PVC-like material, while the translucent charging disk glows red or blue during charging. It's a secure fit, it keeps the watch protected and looks good on a bedside table. What Fossil gets right with compared to traditional electronics manufacturers' smartwatches, as you might expect, is in the overall design of the Q Founder. The casing, the strap and the fixtures ensure this fashion wearable hit enough points of difference to standout from the otherwise similar Android Wear crowd. Except for one major problem: that black-out "flat tyre" to the bottom of the design. It stops the circular watch face from being properly round, just as it's an issue with the Moto 360 and some other models. That alone sees the Tag Heuer Connected a far more enticing prospect, despite its considerable added expense (and we mean considerable). 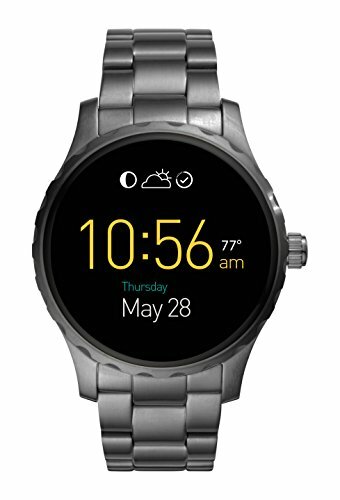 Speaking of price point, we would take the Fossil over the competition as it's competitively priced, in a similar bracket to the Moto 360 and Huawei Watch, yet the better looking option overall. Assuming, of course, you're ok to ditch the heart-rate sensor. As with any Android Wear smartwatch, the other downside is the software, which still feels clunky to use with its card-based notification system and graphics that still aren't well suited to a (sort-of) round display. Overall, it's that "flat tyre" and Android Wear's current state that leave the Fossil Q Founder with more questions than answers. And that only helps to open the door for proper round displays and other operating system prospects, sych as the Samsung Gear S3.